Displaying advertisement in free app to generate some extra revenue is a very common approach use by many developers in many different platform. If you are living in the country where Microsoft Advertising pubCenter is supported, then good for you because you will have a much easier life. But if you are not, or would like to show not only ad from Microsoft provider, then this post if for you. 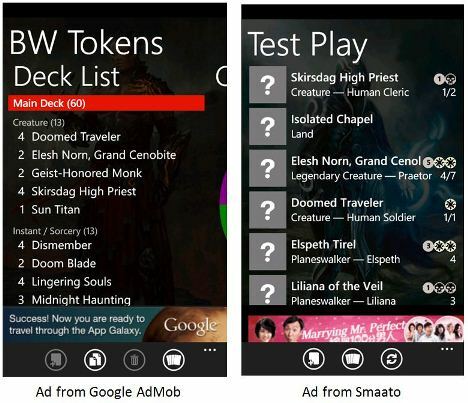 I had personally tried Google AdMob and Smaato ad provider for Windows Phone before. They don’t work out nicely for me. Google AdMob SDK crash randomly when request ad from server (post). While Smatoo didn’t show any ad in the app some time when use in my home country (post). Microsoft Advertising pubCenter is not an option for me since it is not available in Malaysia. Then I come across Windows Phone 7 Ad Rotator, which can show ads from different providers. It support both Google AdMob and Smaato, so I decided to give it a try. End up it work perfectly in my app. The Ad Rotator solve the crash problem in Google AdMob native SDK (now I can use back AdMob) and it also help to display ad from different providers when the other provider fail to show any ad. For example, I set both Smaato and AdMob in Ad Rotator, when AdMob fail to show any ad, Smaato will take over and show the ad instead. This help to maximize the revenue of your free app in many different countries. Currently Ad Rotator is in version 1.0 which support Microsoft PubCenter, AdDuplex, Google AdMob, Inner-Active, MobFox, Smaato and Default House Ad. It also support both Silverlight and XNA app in Windows Phone. You can find a very easy tutorial here. It is very easy to integrate in your Windows Phone app. I will recommend any developer who want to show advertisement on their free app to give this a try. I had now switch to Ad Rotator to display ads from Smaato and AdMob. Mainly because it can switch between different providers. When one failed to show, the others will take over. Second, I can add more ad providers later on without making any changes in my source code. Although I can further maximize the revenue by using different ad providers in different countries (eCPM will depend on the ad display, country and ad provider), but I don’t have any idea which ad provider give better pay on which country yet, so I will stick with 50-50 for Smaato and AdMob currently.